View live Data Monitor application demo! 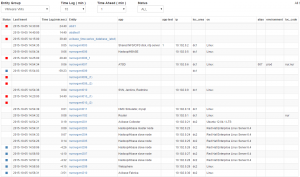 The Data Monitor application was built with PHP using the ATSD PHP client. It delivers data reliability reporting for Entity Groups and Entities. Selecting an Entity Group will display a table consisting of all its Entities with their Entity Tags. 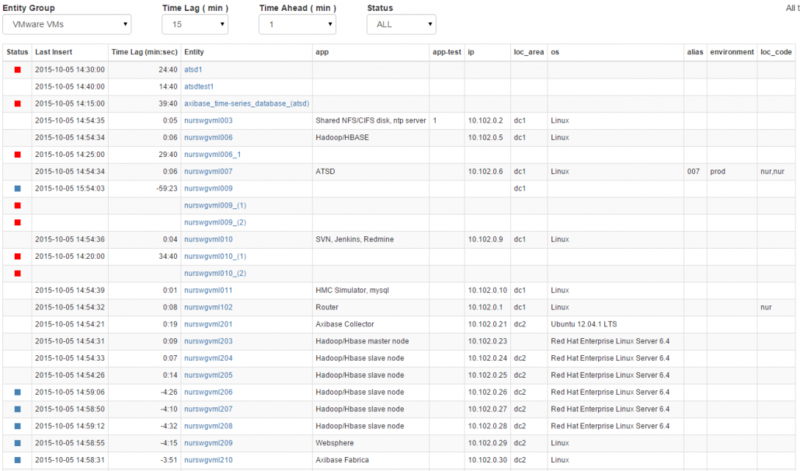 The last insert time of each Entity’s metrics is displayed in the “Last Insert” column and the Time Lag (either ahead of current server time or behind current server time) is displayed. Based on the Time Lag a status is assigned, either Lagging if the Time Lag is larger than the selected “Time Lag” or Ahead if Time Lag is greater than the selected “Time Ahead”. The acceptable Time Lag is selected from the “Time Lag (min)” dropdown. The acceptable Time Ahead is selected from the “Time Ahead (min)” dropdown. Based on these two settings the Status is assigned to each entity. Clicking on an entity will show a table containing all its metrics, their status, last insert time and time lag.